This is the perfect dish for a weekend lunch; fragrant, light and easy to prepare. Leaving you enough time and room for a cheeky treat. I love the subtle aniseed flavour of fennel, especially when combined with garlic and lemon., then gently roasted. 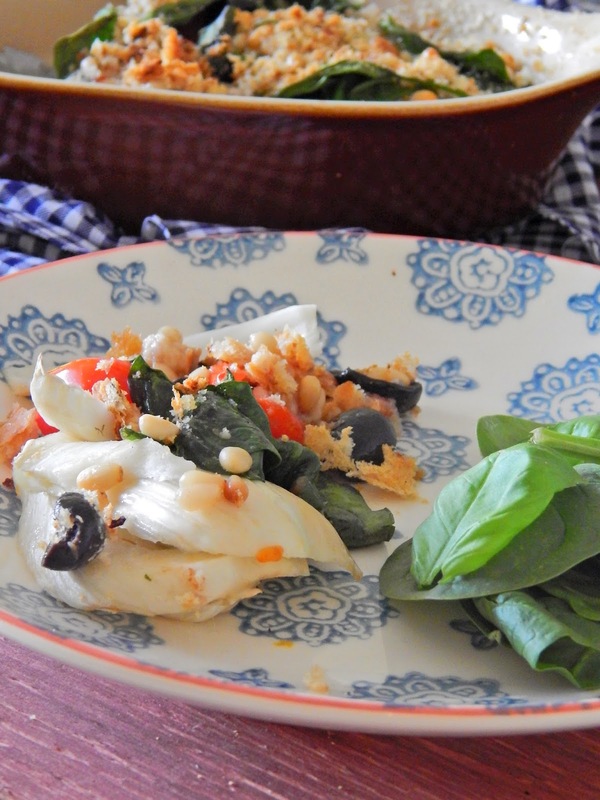 Add layers of spinach, tomato and olives, then top with a crispy, breadcrumb topping and golden pine nuts. This is a great way to use up vegetables at the end of the week. If there’s any left, it’s also delicious served as a side dish with your Sunday roast. 2. Heat the olive oil, fennel and garlic in a pan over a medium heat for 2-3 minutes until the fennel has started to soften. Squeeze over the lemon juice. Spoon the fennel mixture into a flat dish and flatten. 3. Start to begin the gratin layers. Add the spinach over the fennel, then the tomatoes, then the olives followed by the basil leaves, flattening each layer gently. Sprinkle over the pine nuts and breadcrumbs and bake in the oven for 25-30 minutes until the topping is crisp and golden. Season with sea salt and serve hot.